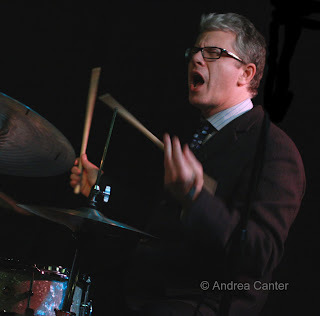 Matt Wilson is not just a virtuosic drummer. He’s a stand-up comic, storyteller, creator, and salesman for all things percussion. Or maybe all things music. He happened to be in the neighborhood (Duluth) with his all-star quartet, Arts and Crafts, and dropped in for a night of mayhem at the Artists Quarter Saturday night. The last time A&C came to town, it was a gig at the Dakota featuring Gary Versace, Terell Stafford, and late bassist Dennis Irwin, who died within the next year. 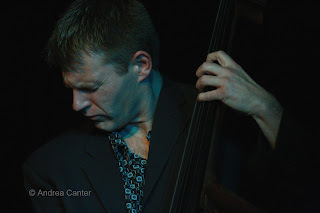 The last time I saw A&C was at the 2008 Detroit Jazz Festival, with new bassist Martin Wind ably fitting himself into the swinging post bop excitement that Wilson and his cohorts can generate from a simple riff. This weekend, with Versace touring with Madeleine Peyroux, we were treated to the fleet-fingers and agile mind of pianist James Weidman, recently making waves as a member of Joe Lovano’s acclaimed Us Five ensemble. 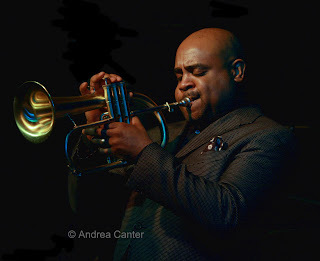 The two sets offered a showcase of sophisticated yet playful interplay and engaging soloing, peppered throughout with commentary from Wilson that veered from relevant musical snippets to a full-blown Saturday Night Live episode. The latter found Wilson reveling in a newly discovered bottled water dubbed “Fred,” climaxing in a cell phone call (on speaker) to the company’s voice mail to deliver a congratulatory message. But the music was the main event, mostly original fare with some well-chosen covers. Ornette Coleman’s “Rejoicing” featured Weidman moving magically from a single melodic line to a full symphony, and Wilson enchanting all with a cymbals solo that was equally songful. Hands-on percussion and a variety of odd objects augmented the trapset on Wilson’s “Scenic Route” while Weidman and Stafford entered into a surprise horn duet, Stafford on trumpet and Weidman picking up a small reed dubbed a xaphoon or bamboo pocket sax. (It sounds a bit like a soprano sax, but the tenor reed gives it a more mournful sound.) 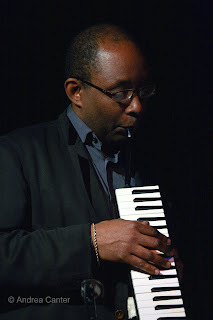 Ever versatile, Weidman also used a melodica on several tunes, including Wilson’s “Stolen Time;” combined with Stafford’s trumpet and the pulse of bass and drums, A&C briefly became a serious little mariachi band. Bassist Wind showed his compositional chops with “Cruise Blues,” featuring Stafford’s delicate flugelhorn. This night boasted some of the most satisfying chamber jazz to come to town in recent years. It even drew Dakota owner Lowell Pickett across the river. There must be something special in that Fred water!